WASHINGTON (AP) — Altering human heredity? In a first, researchers safely repaired a disease-causing gene in human embryos, targeting a heart defect best known for killing young athletes — a big step toward one day preventing a list of inherited diseases. It’s laboratory research only, nowhere near ready to be tried in a pregnancy. But it suggests that scientists might alter DNA in a way that protects not just one baby from a disease that runs in the family, but his or her offspring as well. And that raises ethical questions. “This is definitely a leap forward,” agreed developmental geneticist Robin Lovell-Badge of Britain’s Francis Crick Institute. Gene editing in theory could rescue diseased embryos. But so-called “germline” changes — altering sperm, eggs or embryos — are controversial because they would be permanent, passed down to future generations. Critics worry about attempts at “designer babies” instead of just preventing disease, and a few previous attempts at learning to edit embryos, in China, didn’t work well and, more importantly, raised safety concerns. Normally cells will repair a CRISPR-induced cut in DNA by essentially gluing the ends back together. Or scientists can try delivering the missing DNA in a repair package, like a computer’s cut-and-paste program. Previous embryo-editing attempts in China found not every cell was repaired, a safety concern called mosaicism. 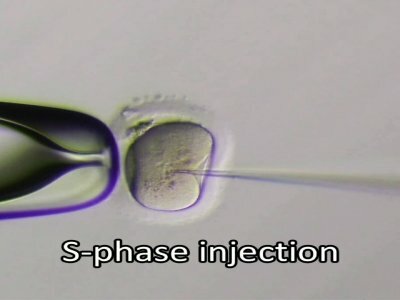 Beginning the process before fertilization avoided that problem: Until now, “everybody was injecting too late,” Mitalipov said. Nor did intense testing uncover any “off-target” errors, cuts to DNA in the wrong places, reported the team, which also included researchers from the Salk Institute for Biological Studies in California and South Korea’s Institute for Basic Science. The embryos weren’t allowed to develop beyond eight cells, a standard for laboratory research. The experiments were privately funded; U.S. tax dollars aren’t allowed for embryo research. Genetics and ethics experts not involved in the work say it’s a critical first step — but just one step — toward eventually testing the process in pregnancy, something currently prohibited by U.S. policy. “This is very elegant lab work,” but it’s moving so fast that society needs to catch up and debate how far it should go, said Johns Hopkins University bioethicist Jeffrey Kahn. And lots more research is needed to tell if it’s really safe, added Britain’s Lovell-Badge. He and Kahn were part of a National Academy of Sciences report earlier this year that said if germline editing ever were allowed, it should be only for serious diseases with no good alternatives and done with strict oversight. “What we do not want is for rogue clinicians to start offering treatments” that are unproven, as has happened with some other experimental technologies, he stressed. Mitalipov is “pushing a frontier,” but it’s responsible basic research that’s critical for understanding embryos and disease inheritance, noted University of Pittsburgh professor Kyle Orwig. In fact, Mitalipov said the research should offer critics some reassurance: If embryos prefer self-repair, it would be extremely hard to add traits for “designer babies” rather than just eliminate disease.